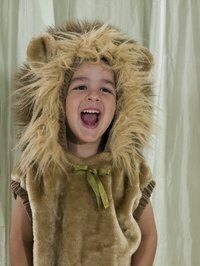 When your child is dressing up as a lion for Halloween, for a class play or for a costume party, you can make the costume more exciting and whimsical by putting a fluffy lion mane headband around her head. Although you can buy a lion mane headband from a costume supply store, save money by making one yourself out of a few basic craft supplies. This also enables you to make the mane as fluffy as you prefer. Cut a rectangle from orange or yellow felt fabric measuring 8 inches wide and 48 inches long. Cut the rectangle into 24 strips, each strip measuring 8 inches wide and 2 inches long. Cut a piece of elastic ribbon measuring 20 inches long. Sew the ends of the elastic ribbon together using a needle and thread to create a headband loop. Load a hot glue stick into a hot glue gun. Plug in the hot glue gun and allow it to preheat for 10 minutes. Squeeze a pea-sized dollop of hot glue anywhere onto the elastic loop, and press the end of one of the felt strips onto the dollop. Hold the felt strip in place for one minute to allow the hot glue to cool and harden. Repeat this process to glue all the felt strips around the elastic loop. Allow the hot glue to cool and harden for one minute on each strip. You can now slide the lion's mane headband around your face to wear as a costume accessory.